For the first time in program history, Quinnipiac women’s ice hockey is ECAC champions. The Bobcats built on their first ECAC regular season title by bringing home their first ever ECAC tournament championship after defeating second-seeded Clarkson 1-0 at the High Point Solutions Arena Sunday afternoon. 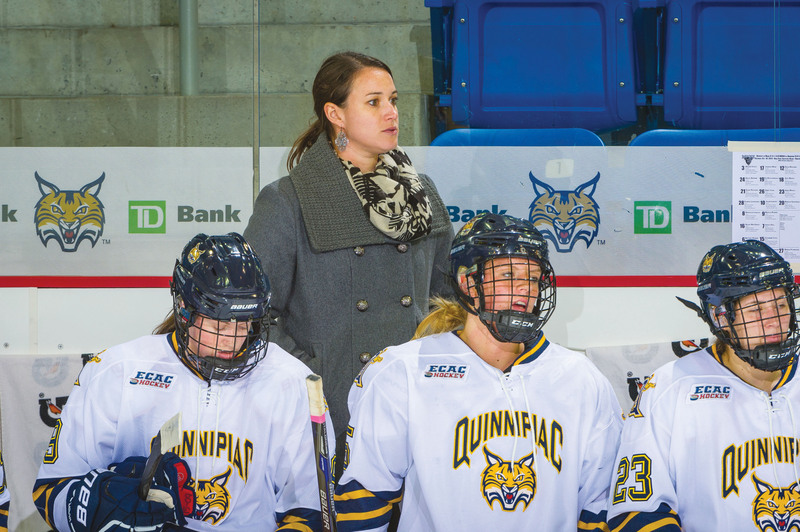 Winning the tournament championship adds to the long list of accomplishments by Quinnipiac rookie head coach Cassandra Turner. As well as winning the first ever regular season and tournament titles in program history, the Bobcats’ 30 wins this season are the most in program history and an NCAA record for most wins by a coach in their debut season. The first period started out all Clarkson, as the Golden Knights registered the first three attempts on net over the first five minutes of the game. However, Quinnipiac goalie Sydney Rossman continued to showcase why she was named ECAC Goaltender of the year, turning away all of Clarkson’s first period shots and 16 shots overall. While both team’s were unsuccessful on the powerplay in the first period, the Bobcats’ offense capitalized before its conclusion. Nicole Brown put a rebound past Clarkson goalie Shea Tiley following a Nicole Connery shot. The goal put the Bobcats up 1-0 and was Brown’s eighth goal of the season. The assist moved Connery into a tie for the team lead with 24 and was her 37th point of the year. The secondary assist also gave captain Cydney Roesler her ninth assist of the season. During the second, both teams came out with intensity on both ends of the ice. The emotions reached a boiling point in the third, as an interference call on Clarkson’s Erin Ambrose caused T.T. Cianfarano and Emma Woods to need to be restrained by teammates. Despite the brief flair in temper, Turner described how proud she was that her team was able to maintain composure. With her 16-save shutout in the championship game, Rossman set the Quinnipiac program record for shutouts in a season with 18. Following the contest, Rossman was named the Most Outstanding Player of the Tournament, as well as the goalie for the All-Tournament team to accompany her ECAC Goalie of the Season honors. Rossman credited her teammates for helping her reach these levels of success. Joining Rossman on the All-Tournament team are Brown, Connery, and Emma Greco. The Bobcats’ win in the finals also marks the first time that the hosting team of the ECAC tournament has won since Cornell accomplished it in 2013. 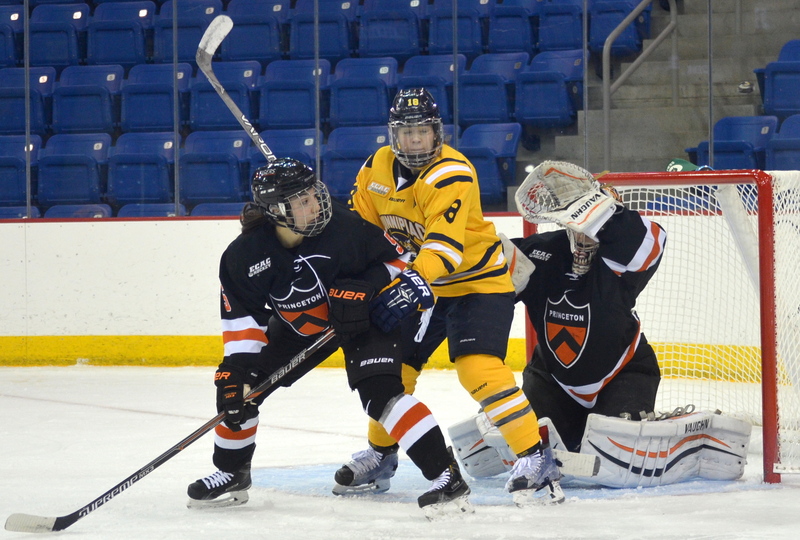 With the ECAC title secured, the Bobcats will now set their sights on the National Collegiate Women’s Hockey tournament, where their seed and opponent are yet to be announced. 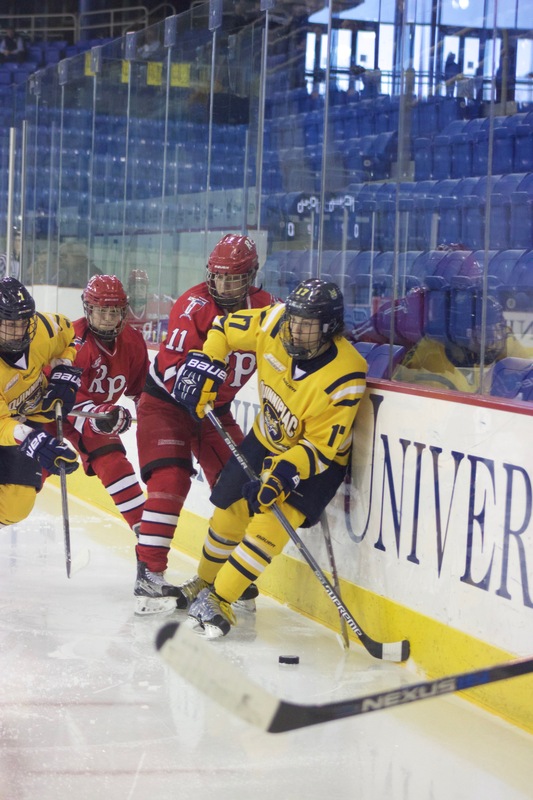 With its regular season concluded – and the ECAC regular season title clinched – Quinnipiac women’s ice hockey looked to carry its four-game unbeaten streak into the playoffs vs. RPI at High Point Solutions Arena. They would do so in thrilling fashion, defeating the Engineers 3-2 in overtime, despite trailing by 2 goals coming into the 3rd period. The Bobcats’ offense looked ready to play early, outshooting RPI 20-2 in the first period. RPI still had a chance early on, however, due to a Quinnipiac tripping penalty. However, Quinnipiac showed why it’s the No. 3 penalty killing team in the country this season, allowing RPI to only get off one shot during the two-minute stretch without scoring. In the second period, the Bobcats increased their shots advantage to 36-5. However, the Engineers capitalized on their chance, as Jaimie Gribsby finished a one-on-one against Rossman with two minutes left in the period. Grigsby’s goal was the first allowed by the Bobcats in 164 consecutive minutes. RPI struck one more time in the period, as a Josefine Hansen slapshot found its way over Rossman’s glove shoulder and into the back of the net with 30 seconds remaining in the second. 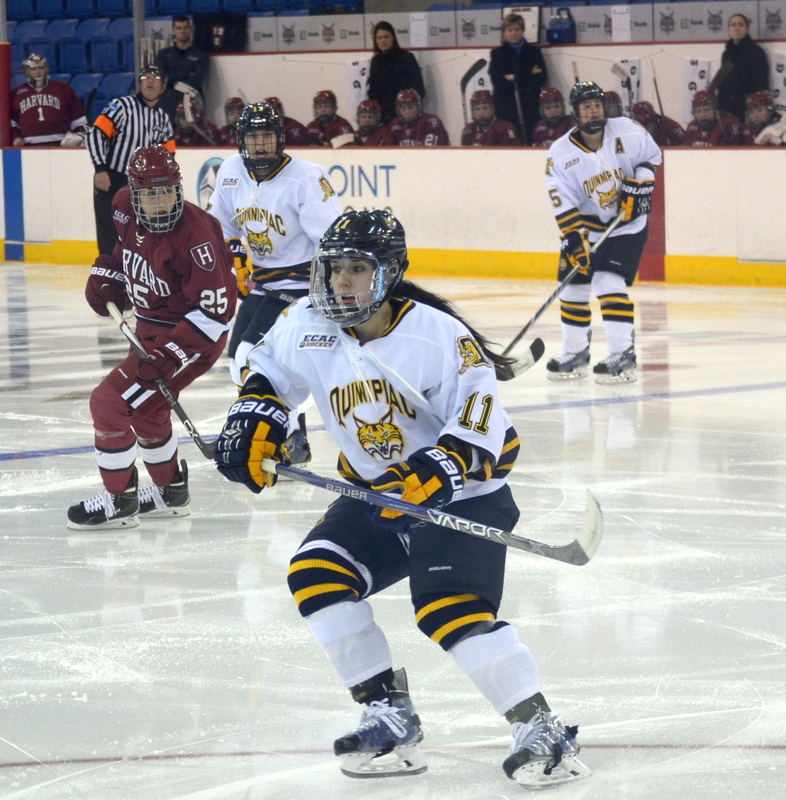 It was the first time the Bobcats trailed by two goals since their loss to Colgate on Feb. 6. The Bobcats continued to create chances from the start of the third period. Emma Woods struck first for Quinnipiac, recording her 10th goal of the season from a scrum that cut the Engineers lead down to 2-1. T.T. Cianfarano assisted the Woods goal, giving her a team-leading 49th point for the season (27 goals, 22 assists). Quinnipiac then tied the game five seconds after RPI returned even strength 7:39 into the third period as Connery recorded her 13th goal of the season, and her seventh point (4g, 3a) in her last three games. Regulation ended with the game level at two each. Quinnipiac’s breakthrough came two minutes into the extra period. Following a drive on net by Cianfarano, Woods, the puck deflected the rebound into the net in controversial manner, as it initially appeared to hit off her skate. Following a lengthy review and discussion by the referees, the goal was upheld. The goal was Woods’ second of the night, as well as the game winner. The assist from Connery gave her the 100th point of her career. Today’s win was the Bobcats’ 27th of the season which is a program record for wins in a season. Turner also tied the record for most wins by a rookie coach in NCAA history. Following today’s victory, the Bobcats will look for a similar result when they face off against RPI again Saturday at 2 p.m at High Point Solutions Arena, with the chance to advance in the ECAC tournament on the line. Nothing is more captivating to the Quinnipiac student body than the men’s ice hockey team. Undefeated in its last 20 outings this season, the women’s team has yet to win fewer than 20 games in a season this decade. With its amazing performance this season (21-1-4), as well as in seasons’ past, the women’s ice hockey team is Quinnipiac’s best sports team, and deserving of far more fan support and general attention than it currently receives. In 2015-16, the women’s ice hockey team finds itself with a top-five ranking for the second-straight year. The Bobcats are playing as well, if not better, than their male counterparts. Led by Hobey Baker hopeful Michael Garteig, the male Bobcats are allowing a mere 1.6 goals-per-game this season, the fewest in the nation. Meanwhile the women, led by junior goaltender Sydney Rossman, are allowing an even more paltry 0.87 goals-per-game. While Garteig has a storied career for the Bobcats and is deserving of all the praise he has earned throughout this season, Rossman has outplayed him. 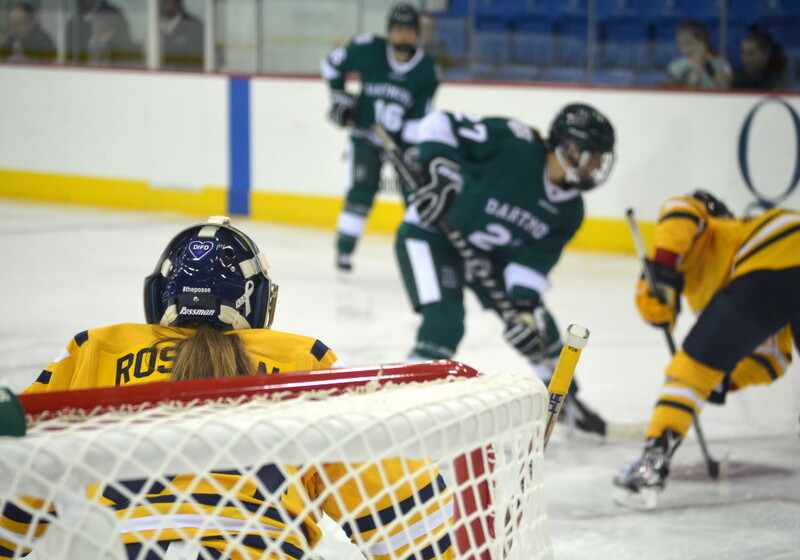 Rossman is 21-1-4 this season, with 11 shutouts and is stopping 95 percent of the shots she faces. Garteig on the other hand is 20-1-5 this year, with six shutouts and is stopping 93.8 percent of shots he faces. Yet, despite the women’s emphasis on defense, they have proven to be just as lethal offensively as the men’s team. Through their first 27 games, the women are averaging 3.2 goals-per-game on 10 percent shooting. The men’s ice hockey team registered slightly more goals, 3.8 per-game on average, on just three more shots per game. While the women have played on the same level as the men as a unit, they have individuals playing as well as any player in the country, regardless of gender. In her first 25 games of the season, sophomore T.T. Cianfarano is leading the way for the Bobcats with 39 points (22 goals, 17 assists), while converting a ridiculous 20.4 percent of her shots. For comparison, Sam Anas, the leading scorer for the men’s ice hockey team, has 32 points (17 goals, 15 assists) and is converting 16.8 percent of his chances. While Tim Clifton may possess the highest shooting percentage in Quinnipiac hockey this season (23.6 percent), he is doing so with half as many shots and 12 fewer points than Cianfarano. Helping Cianfarano carry the load offensively for the Bobcats is the most complete athlete in the entire freshman class, regardless of sport. A product of the same high school that brought us Sidney Crosby and Jonathan Toews, Melissa Samoskevich is playing like a veteran despite only having 27 collegiate games under her belt. In those games, she has seven game-winning goals, including both game-winners over rival Harvard. While her 27 points (13 goals, 14 assists) are impressive, they don’t tell the full story of her impact. 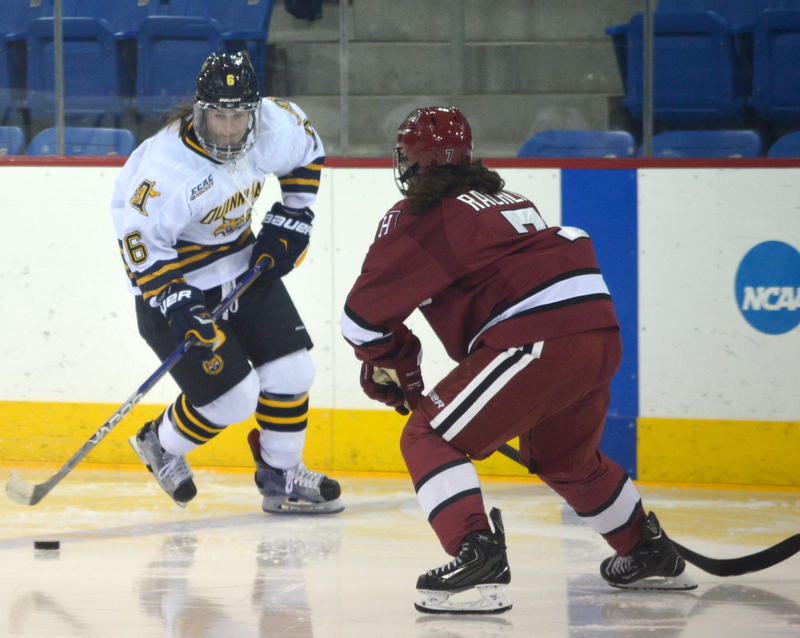 Quinnipiac women’s ice head coach Cassandra Turner has gone to Samoskevich as a defender on several occasions this season as well, and has utilized her on three different forward lines. The team is flanked by several more talented players. Junior Emma Woods leads both teams with 19 assists. Senior captain Cydney Roesler has been a lock-down defender. Nicole Connery, Nicole Kosta, and Meghan Turner have also been consistent contributors on boths ends of the ice. The women are a deep, threatening team on all four forward lines, as well as all of their defensive lines. With only six games, four of which are at home, remaining in the regular season, now is the time to jump on the bandwagon. This year’s women’s ice hockey team is something special and everyone should start to take notice of them before it is too late. The title drought in Hamden is finally over. 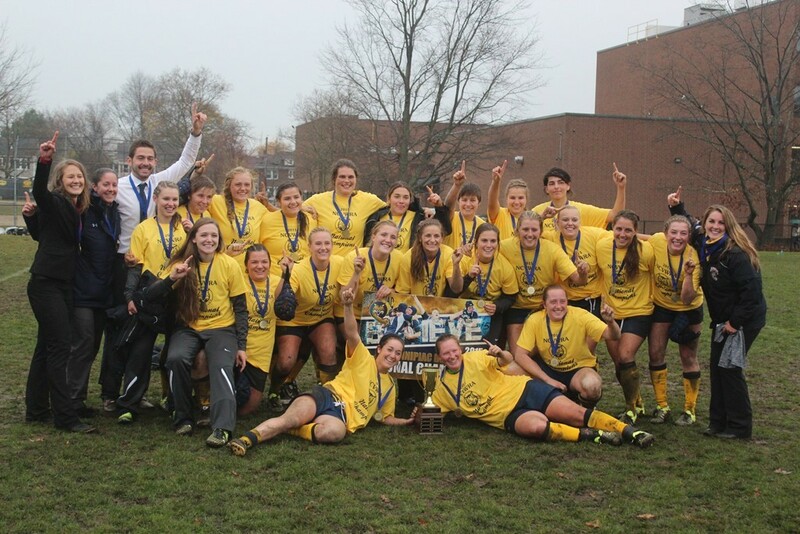 For the first time in the school’s 86-year history, and the five years of the program, the Bobcats h ave a national champion, as the women’s rugby team edged Army in the National Collegiate Women’s Varsity Rugby Association (NCWVRA) championship on Sunday by a final score of 24-19. The Bobcats came into the title game with a wave of momentum from a five-game winning streak. During that stretch, Quinnipiac played consecutive games against West Chester. The team won 100-10 the first outing and 84-7 the second (the last game of the regular season and first game of the postseason). Head coach Becky Carlson described how she and her coaching staff kept their players from becoming complacent during the playoffs after such large margins of victory. Quinnipiac and Army split the season series 1-1 heading into this weekend’s national title game. Army handed the Bobcats their first loss of the season on Sept. 12, and the Bobcats’ only road loss, by the final of 29-24. The Bobcats avenged that loss, topping the Black Knights 20-12 at home on Halloween. Quinnipiac was the first team to get on the scoreboard on Sunday, taking a 5-0 lead thanks to a Emily Roskopf try. Unfortunately, Army responded a mere three minutes later with a try of its own. With the Black Knights’ successful conversation,, Quinnipiac found itself behind 7-5. The two sides each ended up scoring one more try during the opening 40 minutes, Quinnipiacand the trailed 14-12 heading into intermission. Carlson described what she discussed with her players during the break. With just 40 minutes left in their season, Quinnipiac looked to settle down and play its way back into the game. The Bobcats accomplished this goal, as a Raechel Stimson try Quinnipiac put Quinnipiac up 19-14 lead within the first five minutes of the second period of play. While Army eventually tied the game at 19 all, the Bobcats halted the Black Knights’ momentum in the final five minutes of play. Roskopf’s second try was the game-winner. Carlson described how important Roskopf’s performance in the game, both offensively and defensively, was to the final outcome. Another player who was key for the Bobcats was sophomore Mason Johnson. Johnson, who played 10 minutes of the championship game with a partially torn MCL, led the team with two assists and was named Most Valuable Player of the tournament. The national championship victory brings a conclusion to what has been a dominant season for the Bobcats. They finish the year with an 11-2 record, including a 6-1 mark against NCWVRA opponents, and a six-game unbeaten streak. Despite holding a lead that would stand for most of the game, No. 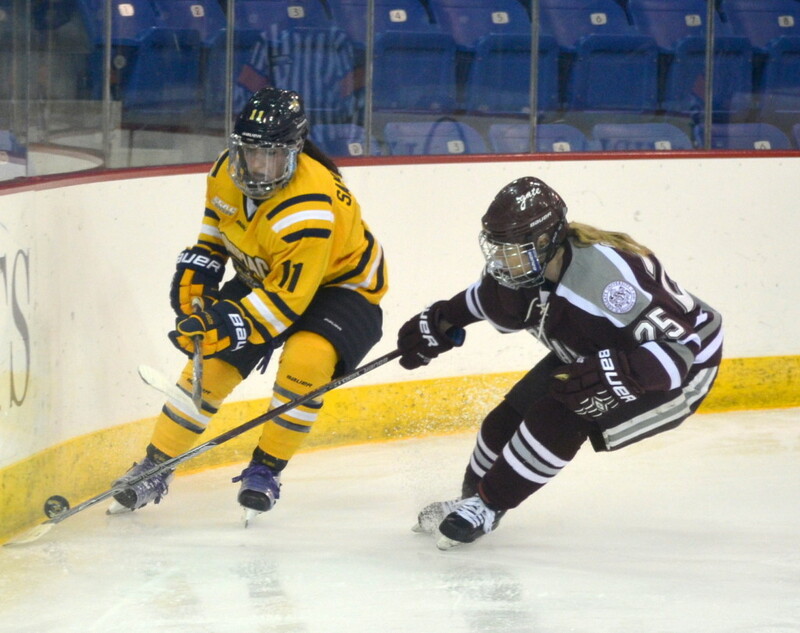 8 Quinnipiac women’s ice hockey tied No. 10 Princeton 1-1 at the High Power Solutions Arena Friday evening. With the score tied 0-0 during the first period, the Bobcats were looking for the play that would put them in control versus Princeton. That play would come in the form of a Meghan Turner goal. Turner’s fourth goal of the season came after she slotted the puck past Tiger’s goaltender Kimberley Newell for the 1-0 lead. With the goal, Turner has now scored in consecutive games. The Tigers would not go down without a fight, though, as the Tiger’s Karlie Lund would slot her own shot past Sydney Rossman and bring the score even with 7:20 remaining in the third period. The score remained tied at 1-1 at the end of regulation, becoming the second of the Bobcats last three games to reach overtime. In overtime, the momentum swung in Princeton’s favor early, but Rossman made a few big saves for the Bobcats during the extra period. The Bobcats would have three shots of their own in overtime, but none found the back of the net and the game ended in a draw. After the game, captain Cydney Roesler discussed the team’s need to improve holding onto a lead. Even though the game ended in a tie, the Bobcats outshot the Tigers 30-21 in the contest. Bobcats head coach Cassandra Turner spoke of the team’s struggles to finish chances. Another area in which the Bobcats struggled was on the power play. 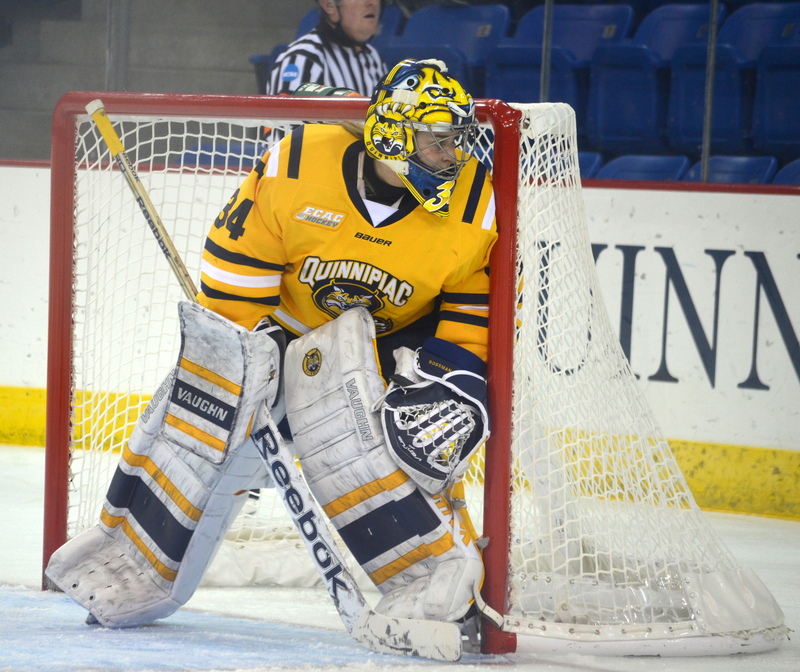 Quinnipiac was unsuccessful on all four of their chances and only mustered nine shots. With that tie, the Bobcats were now 6-1-3 on the season, and 2-1-2 in ECAC conference play. These two teams met again Saturday night, as the series shifted to New Jersey. The Bobcats would correct their mistakes, and beat the Tigers 4-2, behind a pair of goals from Roesler. The win and draw would not affect the Bobcats place in the polls, as they remained in the 8th spot in the USCHO.com polls that were released this week.